In this guide to Summoners War we answer frequently asked questions about the game. We will add more and more questions and answers to this guide from time to time, so make sure you check back frequently. You should also take a look at our review for Summoners War and check out our previous general guide. Should I work on this monster? You can 5 star literally ANY monster you wish WITHOUT CONSEQUENCE. 5 star monsters can always be food later. If you decide you don’t like it, you can use it as 1/5 of the 5 stars you need to 6 star something. *Conclusion:* You can only benefit from 5 starring, nothing is lost. What is the BEST way to farm exp? Recommended farming areas: faimon stage 1 normal. (best for newer players). Tamor 3 is also very good for newer players! Hydeni stage 5 (hell is really easy) and some others. We’ll get back to this later. As you get stronger you will aim to farm Faimon hell (stage 1) and Aiden hell (stage 1). These 2 spots are amazing for higher leveled players! Make SURE that double exp booster is ACTIVE at all times! Friend’s Reps and you! Making the best out of x2 exp boosts! So you just popped that x2 exp booster, and farming fodder. How can you make the most of this situation? Using a friend’s rep will allow you to free up a slot in your team! The Rep does not take absorb any exp like your own bus driver will! Completing the map will give a set amount of exp, which is divided by however many units you bring. using simple numbers; let’s say a clear gives 100 EXP. If you only have 1 unit, that 1 unit will get all 100 EXP. If you have two units each unit will get 50 Exp EACH. At 4 units, you will get 25 Exp Per monster. What runes should I put on this monster? Non-attackers have three main sets: Despair, Swift, and Violent. Honestly THERE ARE NO WRONG ANSWERS. -It is wise to rune units that have AoE with DESPAIR, for more chances to stun. -It is wise to rune people you need to move/initiate/buff fast, with SWIFT. -Lastly it is wise to rune monsters that need to refresh cooldowns quickly with VIOLENT. -Violent/blade/revenge. For % chance to 100% to 0% nuke units. -IN some ODD cases, you might rune fatal. Bombers or Non-traditional attackers, Fatal is first choice. (they different mechanics from standard attackers). Fatal is also a good choice when beginning your summoners war journey. As you get higher crit chance on your runes please see the previous suggestion! What is the best way to farm runes? Giants b8/Dragons b6-b7 still fine. Push for Giants b10/Dragons b9. Should I buy this rune? A more personal answer would include answering this question, with a question. -Do you have Mana for “x” rune? -Do you have someone that could immediately make use of this rune? -Do you already have a rune in this slot with the same %/subs? -Do the Subs have flat units or ‘%”s? -Do you think a monster could benefit a lot from this rune? If you answered yes to most these questions, probably buy it. If still unsure, please visit the links posted above. Advanced rules for rune filtering! × Don’t keep runes that have two or more flat subs. × Don’t keep runes that upgraded a preexisting flat sub. × Don’t keep 5* runes unless they are legendary and posses useful subs. × Don’t keep a rune that had two consecutive low rolls while upgrading it. × Don’t keep a rune that upgraded resistance unless it’s endure and possibly energy. × Don’t keep an off-hand (slot 1, 5, since 3 can’t have attack subs) fatal rune that upgraded a defense sub. × Don’t keep a swift rune that doesn’t have speed subs, unless it has at least two other important subs with high rolls. × Keep only main-hand (slot 2, 4, 6) runes that have three useful stats, counting their suffix. × Keep only off-hand (slot 1, 3, 5) runes that have four useful stats, counting their suffix. 5 star runes are fine to +15 on slots 2/4/6 imo. +15 5 star rune for hp (for example) is 51%, 6 star is 63%. Yes you miss out on 12% bonus HP but even for the HIGHEST base value hp monsters (13,000 base hp) that is only 1,560 hp. Honestly you will survive without that. Now 3 hp% 5 star runes vs 3 hp% 6 star runes is nearly 5,000 life. 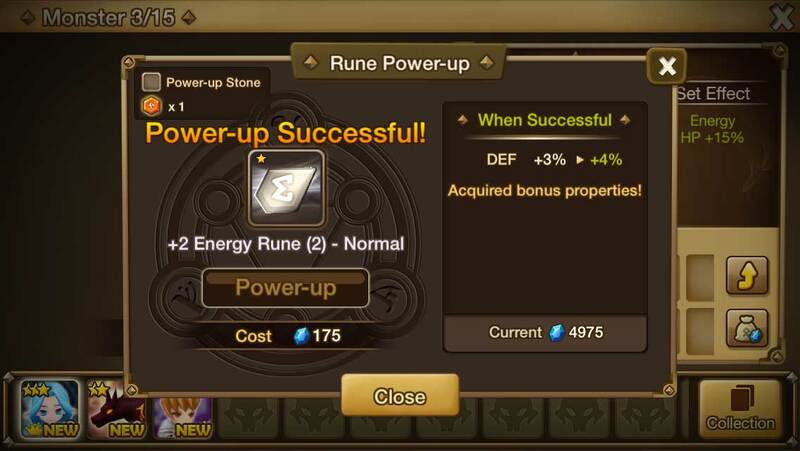 Which can be a big deal, but you can always level the rune to +15 and switch it out for a 6 star rune later! So no harm done. Obviously it’s better to +15 6 star runes, but +15 5 star runes is honestly just fine. DO NOT +15 1/3/5 slots tho. Only the MAIN stat will increase, which doesn’t help the subs. They are only flat stats and +15 wont serve you that well. 1/3/5 slots should be +12 at max, +9 is also just fine imo. Should I 6 this monster? First off, we honestly feel anything worth keeping is worth 6’ing, and even though it’s hard to get started, eventually you will 6 all the monsters possible. Anyways let’s get back to it. This question we answer with a series of questions: Do you use this monster a lot? Do you think it will help you advance? Is the monster dying at 5 stars? If your goals are PvE related, is it a PvE monster? If your goals are PvP, is it a PvP related monster? Do you have it runed? If you answer yes to any/most of these questions, then yes. It is worth 6 starring. What should my Giants b10 team be? Shannon, Bernard, Bella. These 3 should be and are the best foundation to any giants team. Yes they are basic monsters, Yes they are farmable. Yes they are worth 6’ing. And Yes there are amazing units to have. Once you have those 3, next you will want +1 cleanser/side healer/shield unit/ or tank. The last slot should +1 attacker (for speed), OR +1 support (for safety). What should my dragons b10 team be? Vero, Bella. These 2 units are the basic components to any dragons b10 team. That leaves +3 units. To decide what to use, ask yourself what kind of comp would work best for you. AD, GW, AO- Higher leveled players. If you need help with your AO, you might want your IQ checked, honestly it should change to every different AD you see. It should be all your top monsters, and you should never set your AO in stone. 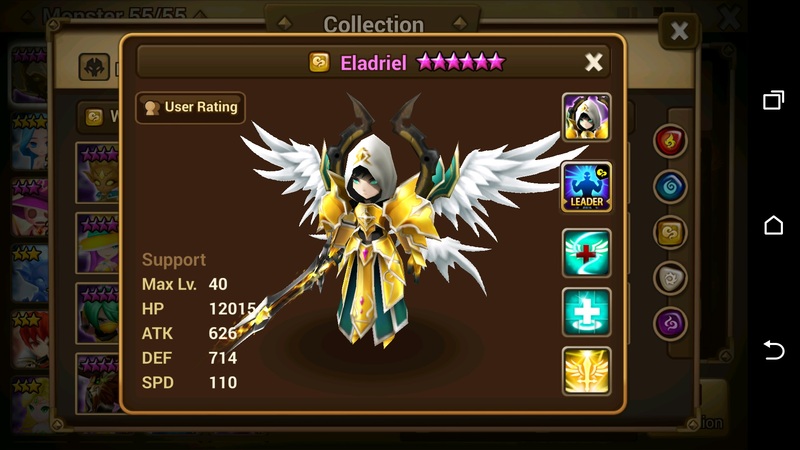 AD, try to aim for this standard CONQ AD – Vero, Darion [chasun/chloe], [Briand/theomars/bella]. Guardian – will depend on your runes, and the nat 5’s you have. It can be done WITHOUT nat 5s, but trust me, it will make life easier. If you are not level 35 Just don’t even think about arena. Don’t put up great defenses until the weekend. Practically forget it exists. You wont be able to push high ranks, which are a LUXURY. All pushing rank does, is prove to yourself how strong your monsters are. Don’t fool yourself, if you aren’t lvl 35+ you wont be able to compete higher than fighter. It’s MOST EFFICIENT to put little-to-no-defense at ALL, and push on reset day just for crystals. Keep in mind going a rank up only gives 50 extra crystals. It’s really not that big a deal. Losing is okay in AO; it lowers your ranking to get easier opponents, and you still get one glory point per loss. (TL;DR): Just make sure to farm enough points for the weekly devilmon! Also weekly GW’s rainbowmon is an important buy! If you farm extra glory, all the better! 180 points a week should be the goal though. Why can’t I beat “X”? What should I spend glory on? First of all, make sure to get your weekly devilmon (180 glory a week). Also make sure to get your 4* max rainbowmon from guild wars every week!. Next work on your energy buildings. Making these capped will allow you to farm more runes/exp and overall play the game more at a time! (TL;DR): Don’t buy MS from the glory/GW shop. Like EVER. Seriously, enjoy this game! It is amazing, and we all share it. This game has no right or wrong way! We are on our own, and the smarter/more knowledgeable you are as a person, the more you can make of Summoners war! Be the first to comment on "FAQ to Summoners War"